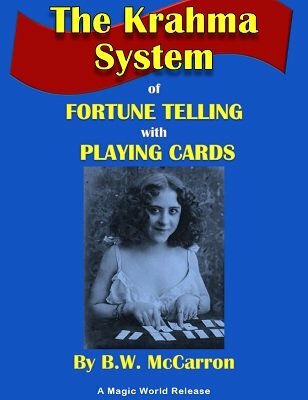 Unlike most other fortune telling systems with playing cards, readings using this system are quick and snappy. The card layout is streamlined, yet the subject will be satisfied she received her money's worth since the outcome of the reading is dependent on her feelings and conscience. The reader will like it, too, since six to ten readings can be performed per hour. This system also provides an opportunity to recycle playing cards when they're no longer useful in the magic act. With the Krahma System, the more care-worn the deck, the better it will be accepted by the Subject as an instrument of destiny! 1st digital edition 2015, 38 pages.